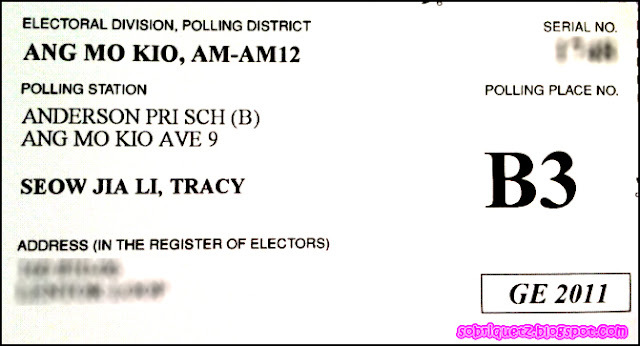 Yes it's my first time voting. I am in AMK GRC, so I don't think there is much of a dilemma. Then again, even if I were in other constituencies, I wouldn't even be in much of a dilemma. I am extremely pro-PAP. Yes, I have bravely said so, slam me if you want. Somehow, PAP supporters are getting slammed excessively this time around. I cannot understand why. Even when they have already tried to end the conversation with "to each his own", the opposing parties just keep lambasting back. The worst scenario I heard was when someone actually put his arms on another person's throat (i.e., strangling) and said "if you vote for PAP, I will KILL YOU". Eh seriously, I wanna vote for them, YOU GOT A PROBLEM HUH? This GE has definitely brought out the worst in people. I cannot understand the demands/complaints of some people. They demand that the government provide them with a good education, good job, good retirement, blah blah. They don't owe you a living okay. Despite them being civil servants and that they are SERVING the people, don't treat them like your foreign helpers (i.e., maids). Not that you should treat your maid badly, but I do think that most people treat them as a lower being. In fact, I seriously dislike the facebook note which has been spreading around about "which maid to choose". And since there has been some analogy obsession (think driver, co-driver, co-pilot, whateverrr), I have my own analogy of the situtation at my estate. my daddy drove me out for my pre-employment examination in AMK Healthlink Clinic. As we were leaving the estate, I noticed that there were only PAP posters up on the lamp post. Hmm, where were the RP posters? I don't even know anyone in RP, except that there are 23/24yrolds in it. In fact, there isn't much news about them either. I only notice ONE tiny article about RP in AMK GRC in The Straits Times (and I don't think ST was bias or what, there probably wasn't much to report about). As we were driving back, EH! something new and yellow on the lamp post - omg, it's the RP poster!! Fresh and new, only appearing 3 days to polling day. It has not been exposed to all the heat, wind (okay, not so much wind) and rain which LHL's face has endured over the past days. In my heart, I was like WOAH. What an apt representation of the current situation. Suddenly, the clouds overshadowed the sun and it just poured and poured. Flash floods occured around the AMK and YCK area. I wondered - will the posters be able to withstand this heavy downpour? 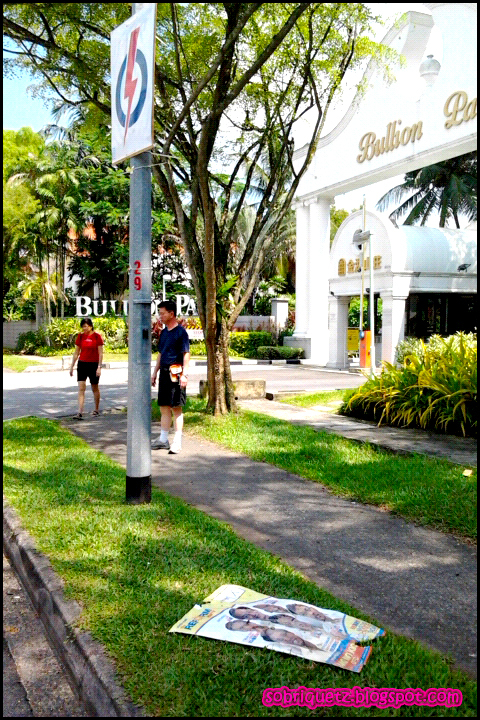 6 May: As my family was heading for my grandma's house, we drove past the lampposts again and... EH! 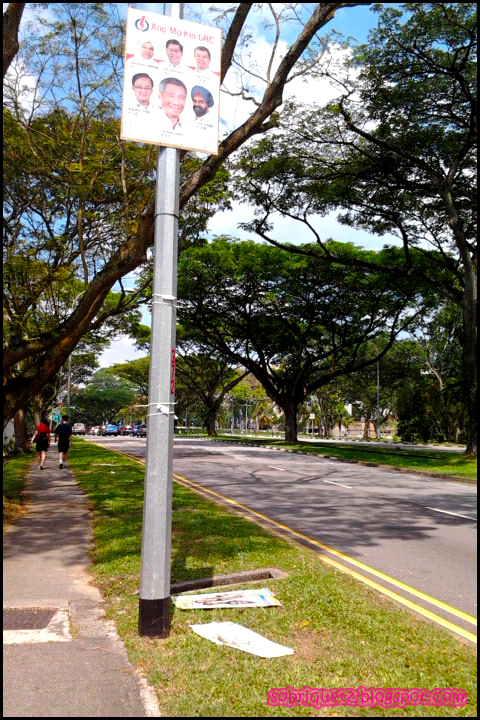 RP's posters were on the floor, all tattered and torn, while PAP's posters were still tightly secured on the lamppost. The posters seem slightly older, but it was still standing strong. Accurate eh? I have never heard of RP nor do I know any of them. Then suddenly during this elections, they pop up and want to seek our votes. But nope, they have not come to my estate at all. There is seriously no reason for me to vote for them, and I don't get why others will want to do so. Opposing for the sake of opposing? I disagree with that. Voting for RP so that they can hopefully get back their deposit? Sorry, I ain't so kind hearted. My estate was previously under the nee soon south ward, under Lee Bee Hwa's (i hope i got the name right) care. When the North-South Expressway was announced, she came to have a minister's talk with the residents (though I did not attend it). According to my mummy, monthly updates are also sent to residents so that we know what's going on. Not bad eh! So today, my parents and I headed to Anderson Primary School to cast our votes. As we did not want to meet any car park problems, we decided to walk instead. I estimate that it is about 2km away. Don't tell me that RP has no money. Yes, they probably have less, but if they were a good team and were able to convince residents to vote for them and support them, they could perhaps have gotten more funds or donations. Don't say it's not possible. Polling took less than 5 minutes in total. I barely stopped for 3 seconds throughout the way. Showed my polling card, barely stood in queue before I was directed to the tables. I did, however, paused awhile before putting my X. Haha, machiam taking exam, abit scared. Had to look really carefully. And I didn't know how big to put my X. And this marks the end of my voting experience. I will most likely be staying up tonight to see the results. I hope the PAP do well :) and that FB / Twitter will move on to other topics after today.